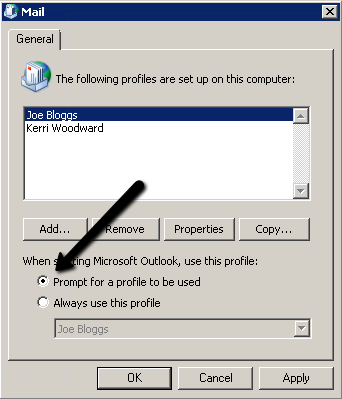 When using Microsoft Outlook you can use and create multiple Outlook profiles underneath the same Windows user login. 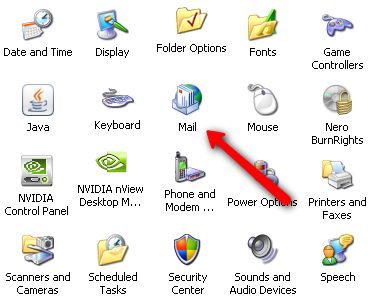 Each Outlook profile can have its own set of email accounts, its own email folders, and independent software settings. Please note that you can only operate one Outlook profile at a time, and you must close and re-open Microsoft Outlook to switch between profiles. This tutorial illustrates how to enable switching between multiple profiles with Microsoft Outlook. To have Microsoft Outlook prompt you which profile to load when you open Microsoft Outlook, select the option Prompt for a profile to be used and then click OK to save your settings. Close and open Microsoft Outlook to switch profiles.